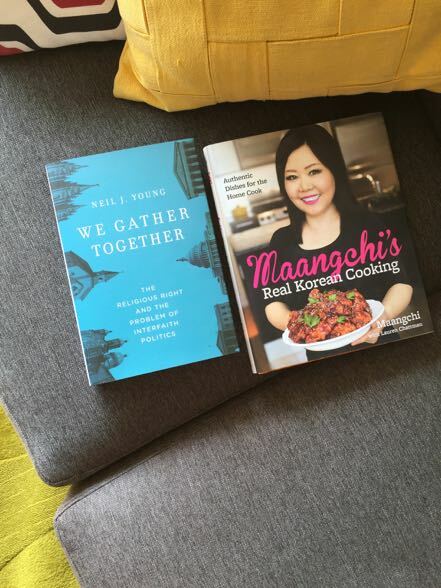 A quiet Saturday is suddenly made exciting with the arrival of Maangchi’s Real Korean Cooking — as well as We Gather Together, my friend Neil’s new book that you all should buy! 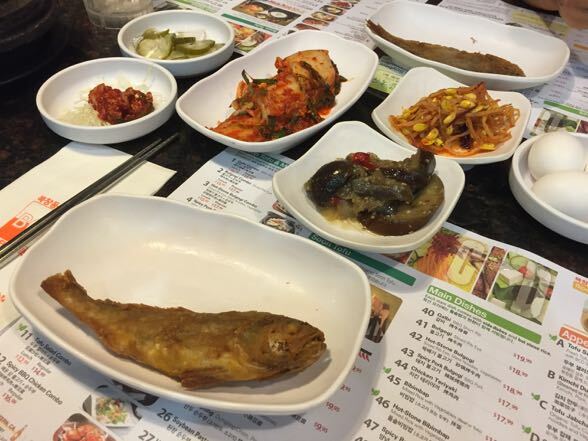 My first plan of attack was to make a bunch of small side dishes or banchan. 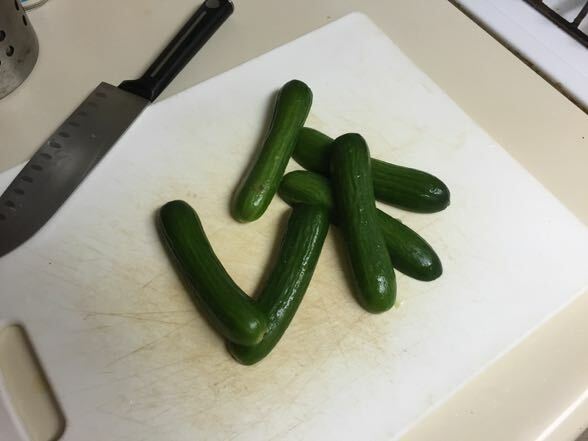 These kirby cucumbers are about to get sliced up for a spicy cucumber salad. I sliced on a bias and felt oddly sophisticated afterwards. 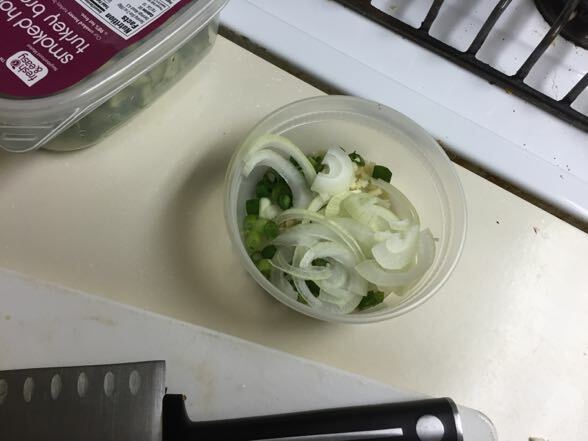 In a separate container, I assemble some chopped garlic, sliced onion, and some scallions. 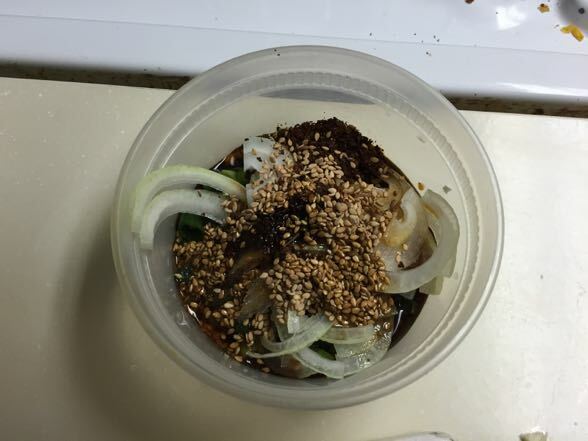 Soy sauce, Korean hot pepper flakes, sesame oil, sesame seeds, and sugar enter the fray. I keep this dressing away from the cucumbers until I’m ready to serve it all up. 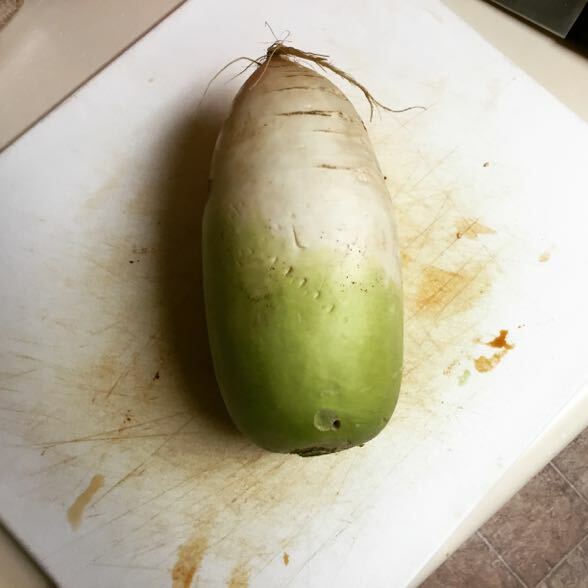 Meanwhile, it’s time to start on some radish kimchi. 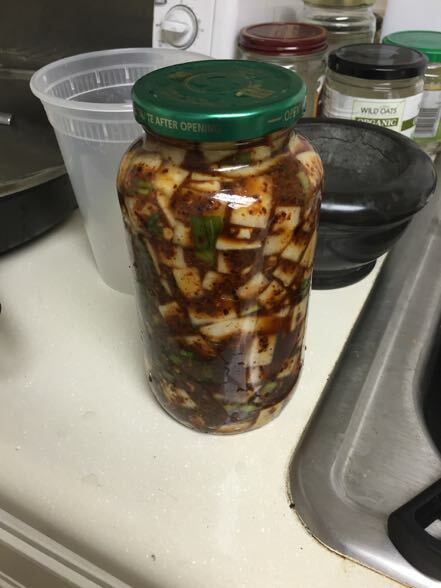 This requires two Korean radishes, but I’ve only purchased one; so I will halve the recipe. Remember that. 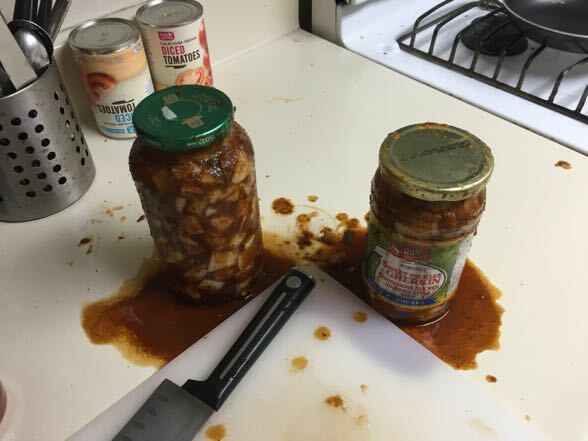 I’m supposed to halve the recipe. 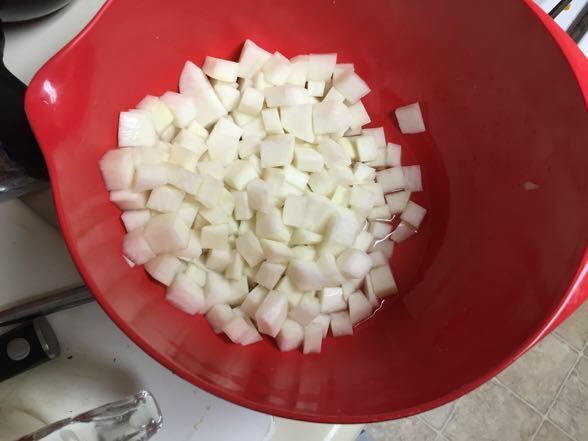 I peel and chop up the radish, sprinkling it with salt and sugar, but only half the amount called for in the recipe. Now I wait an hour. Meanwhile, the time has come to blanch and chop kale. 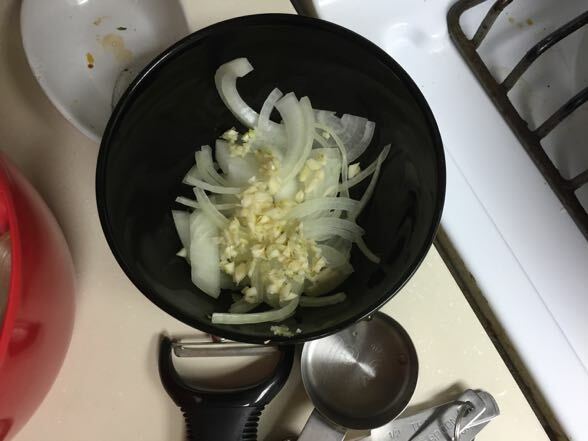 I have also assembled some garlic and onion — a recurring theme. 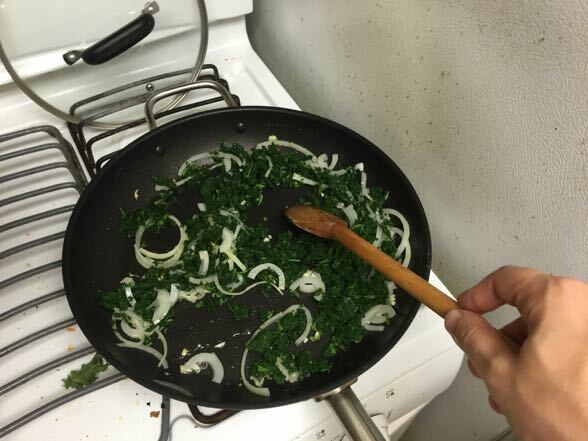 Sautéing ensues. An errant leaf of kale will soon reach to a crispy demise. In goes the kale for this is to be stir-fried kale with soybean paste. 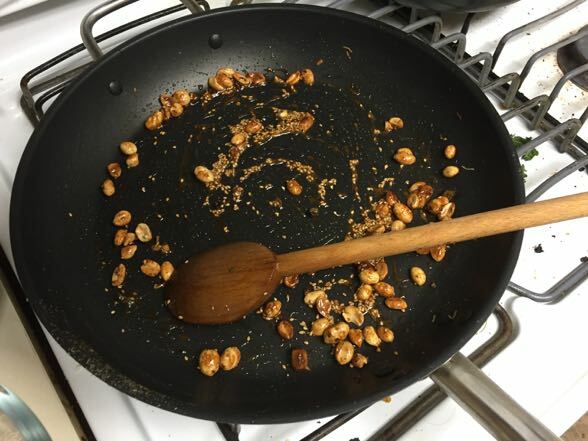 After a few minutes, I add the soybean paste as well as some honey to the pan. The lone kale leaf continues to be neglected. The kale dish is done. 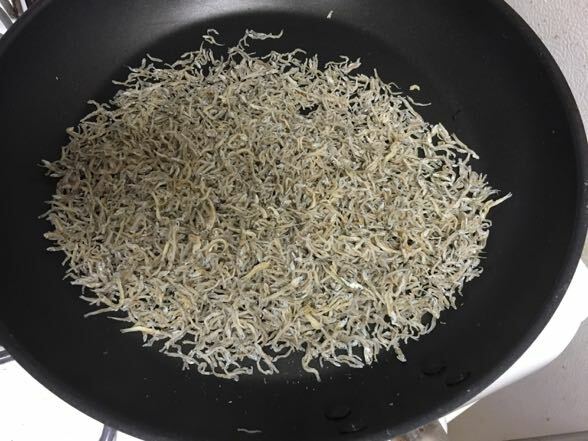 Now it’s time to reset and fill the pan with tiny, tiny anchovies for a dish called janmyeolchi-ttangkong-bokkeum. 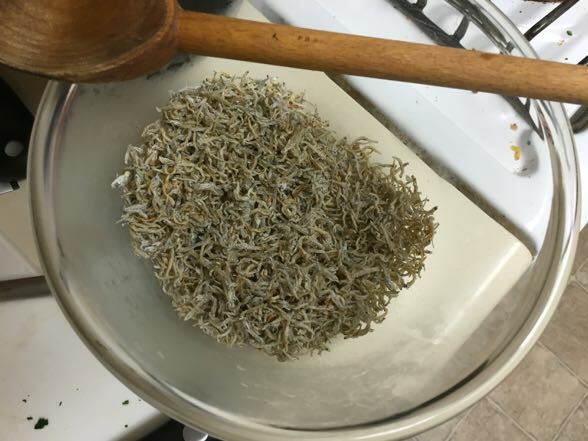 After I toast the anchovies for a little bit, I discard them into this bowl where they await further degredation. Meanwhile, it’s time to cook some peanuts with oil, garlic, and a chili pepper. The anchovies return to the action, but this time with some honey and sesame seeds. We’re done here. Time to check in on my radish. There’s now a quiet puddle of water in the bowl. It must be drained. 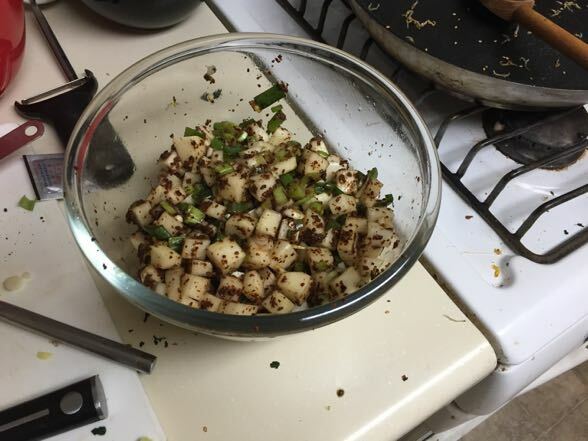 I add various ingredients to the radish, including my Korean hot pepper flakes, which are old and have turned brown. Not pretty. There’s some tossing and massaging, and soon the radish is thoroughly speckled with pepper flakes and other useful ingredients. Into the jar it all goes. I must squeeze it all in there, lest any air bubbles ruin everything. Oh wait, there’s more radish to squeeze in. 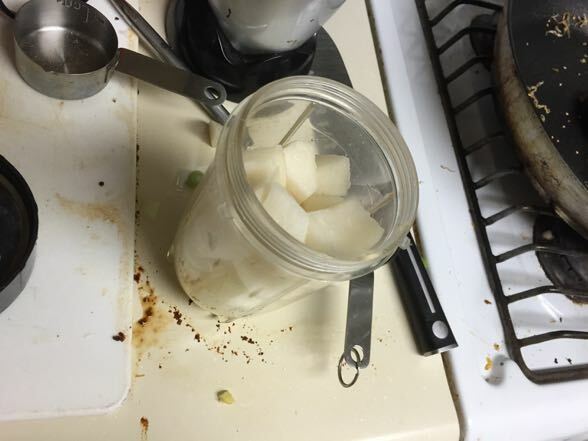 This creates a graphic mess on the counter, but amazingly, I do manage to squeeze that entire radish into this former Prego jar. It’s only then that I realize that I didn’t halve the ingredients after I drained the radish cubes. IT WILL BE TOO SALTY. I’VE RUINED EVERYTHING!!! Still, I must press onward. 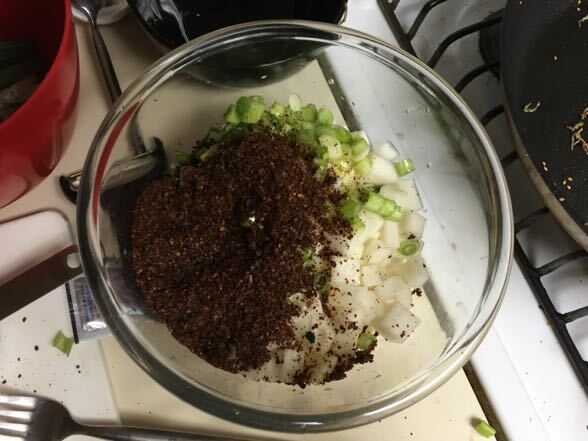 Time to make a marinade for bulgogi (yay!). We start with Asian pear. 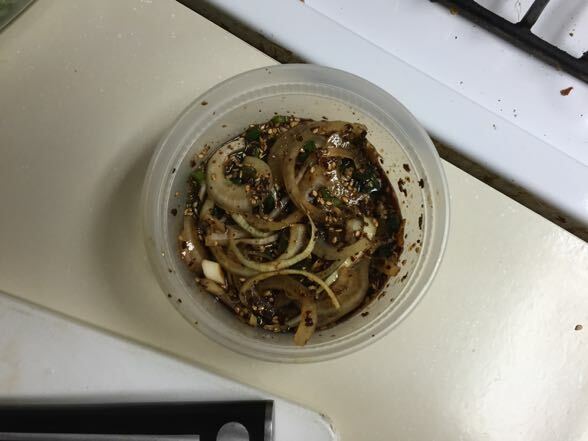 We end with garlic, sugar, soy sauce, and all sorts of other things. It gets tossed with meat and thrown in the fridge. I go out to Korean food! In a surprise move, I wind up going to BCD Tofu House with Sly and her now-fiancé (!!). It’s delicious. And yes, a bit counter-intuitive to abandon my Korean feast at home, but listen, I know nothing I make in my kitchen could be as good as the real thing. 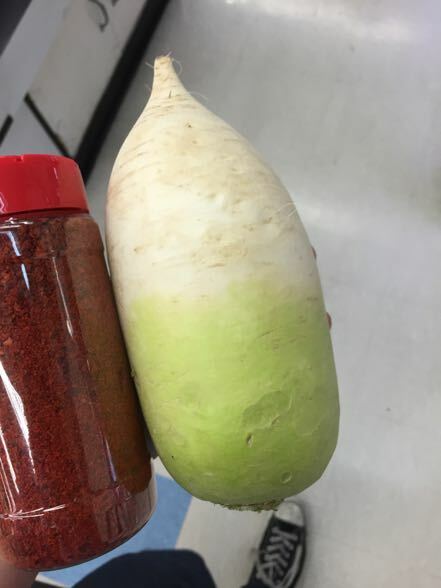 Plus, going to Koreatown for dinner gives me a chance to grab an extra radish (my friend Eunnok’s idea) that I can use to save the kimchi. Also, fresh (read: RED) Korean hot pepper flakes! 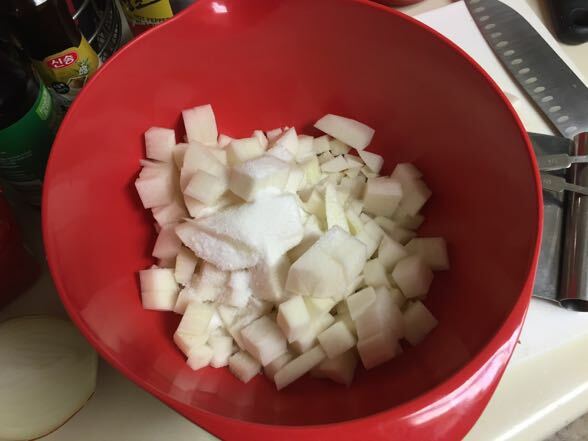 Well, I peel, dice, and mix the radish with sugar and salt. After an hour, I drain it, and then I toss it with the stuff that’s been fermenting for a day already. This means the carnage has now spread to a former gherkin jar. The next day, I finally eat my food (and to be clear, I could have totally eaten it the first day. I just was taking my time with the whole process.) Worth noting is that the cabbage kimchi and the fish cakes (orange, in the foreground) are store bought. Some homemade dipping sauces for good measure. Overall, very good. 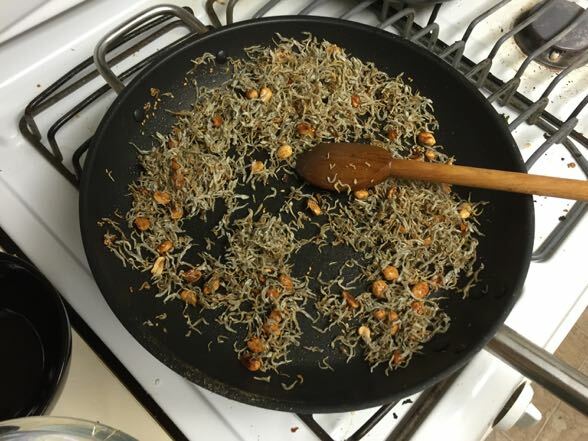 Some dishes were very strong, particularly the anchovies with nuts. That was by far my favorite; although, I did need to add more honey than the recipe called for. 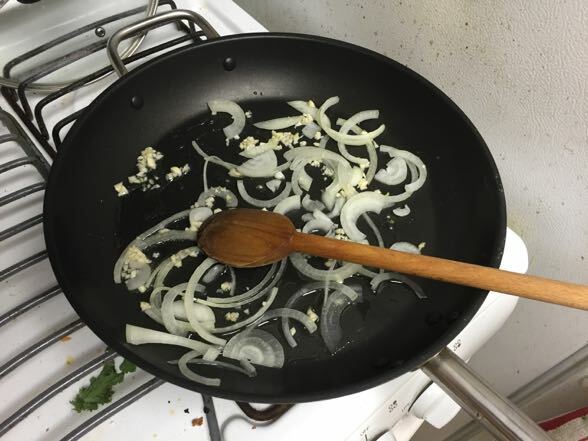 Additionally, it was very salty — as were many of the dishes — but I’m unclear if that’s a problem with the recipe or a problem with the ingredients. A big takeaway here is to taste as you go, if you can. That should always be the practice, of course, but really take it to heart here. After the anchovies (which I’ve been snacking on all week — salty, nutty, fishy, and sweet: it works so well), my other favorites of this bunch have been the radish kimchi and the stir-fried kale. 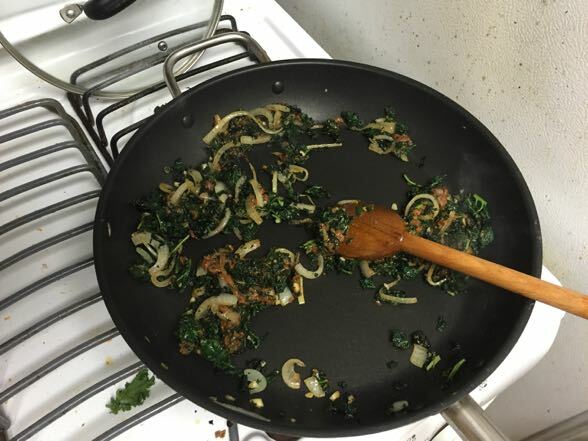 There was perhaps too much soybean paste in the kale, but nothing that would ruin the dish. I found myself returning to this banchan over and over again with every meal (and yes, this stuff stretched over several lovely lunches and dinners). 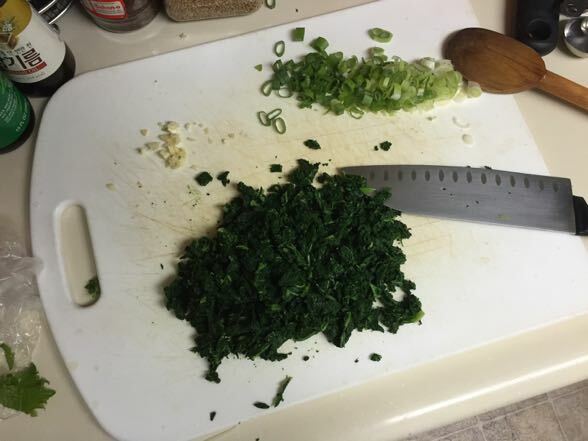 In the future, I will be sure to be more generous with the amount of kale I stir fry. As for that kimchi — disaster was indeed averted, and the final product tastes just as good as any Korean radish kimchi I’ve had in K-town. Hit it out of the park! 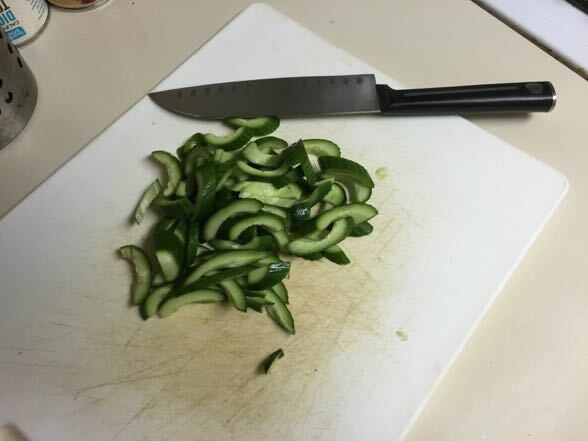 Meanwhile, the cucumber salad was perfectly lovely — a great small side or perhaps a sturdy offering at a potluck. 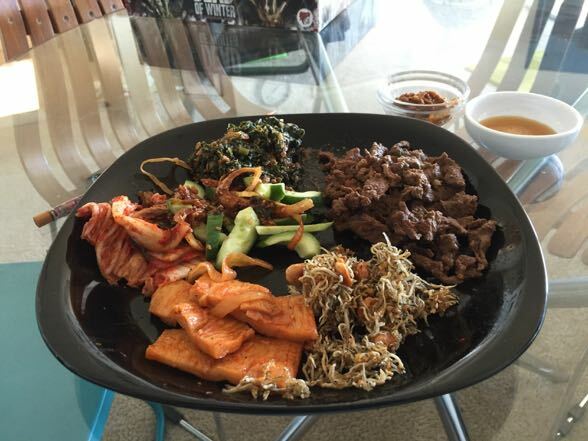 It’s so easy to make that this will clearly be a simple go-to when creating a Korean meal in the future. Just about the only disappointment was the bulgogi. This was shocking. After marinating for a day in the fridge, I was expecting boffo flavor. Unfortunately, the final product was woefully underseasoned. There was definitely flavor — I could taste everything in the marinade — but it lacked salt. It was so glaring that I couldn’t help but wonder if I had neglected to add the soy sauce. I’m determined to make it again and see if this was indeed user error. 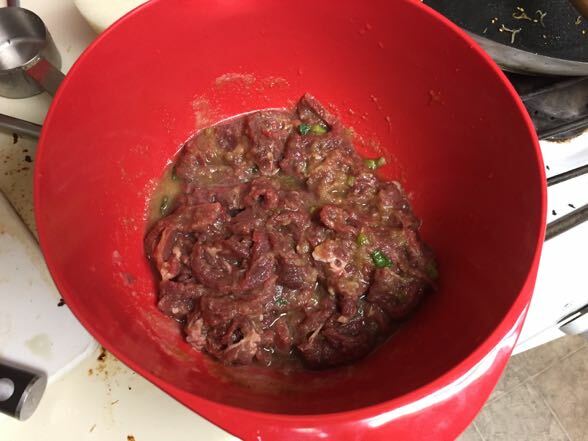 However, I compared the bulgogi recipe to others I have, and the soy sauce-to-beef ratio is a bit lower than average. Ultimately, however, this was a supremely easy fix. 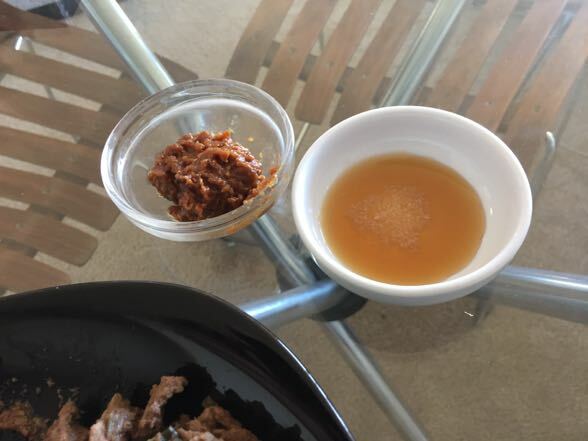 I just added some dashes of soy sauce to the cooked meat. We were back in business. Plus, even without the added soy sauce, it wouldn’t have been a major problem. From years of eating Korean BBQ, I’ve learned there’s a whole wonderful world of meats outside the realm of galbi and bulgogi. These unmarinated preparations are grilled and then rolled up with various items such as kimchi, scallions, and pretty much whatever else is around on the table. Dunk the whole thing in a dipping sauce, and it’s a phenomenal little package. 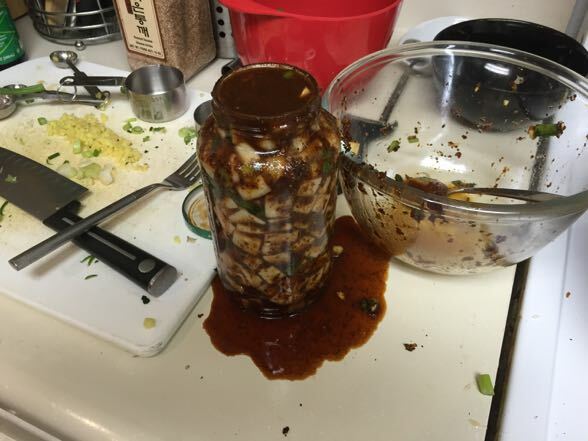 And so if your bulgogi turns out lacking in flavor, let the Korean condiments do the heavy lifting. 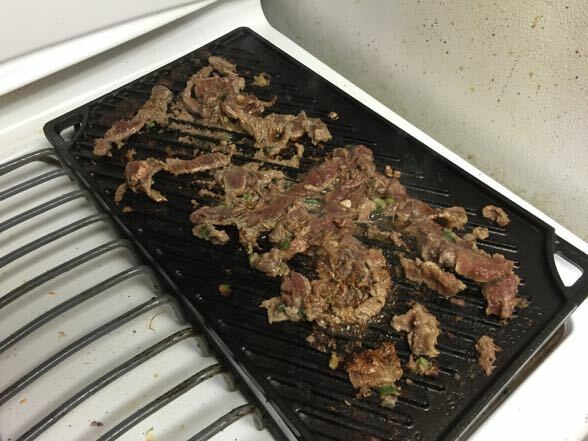 That being said, the bulgogi really should have had more flavor. I’ll double check to make sure it wasn’t my own stupid fault (totally likely) and then update as necessary. (I should mention that the next day, I heated up some leftover cooked chicken in Maangchi’s spicy stir-fried pork sauce, and it was deeeeelish). Do you have this cookbook? What have your experiences been with it? What’s your favorite Korean cookbook? 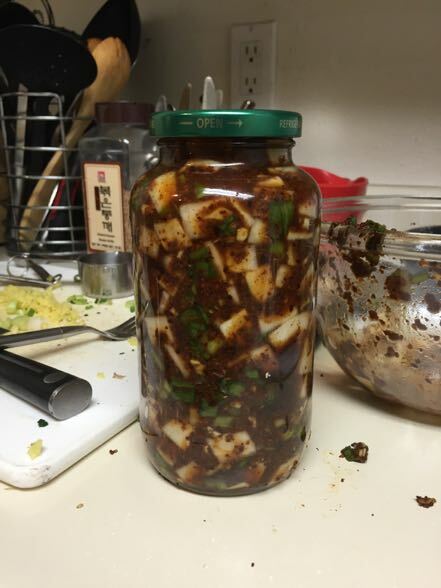 This entry was posted in Adventures in Domesticity (Recipes), Food and tagged Adventures in Domesticity, food, Korean things, Maangchi by Ben Mandelker. Bookmark the permalink. 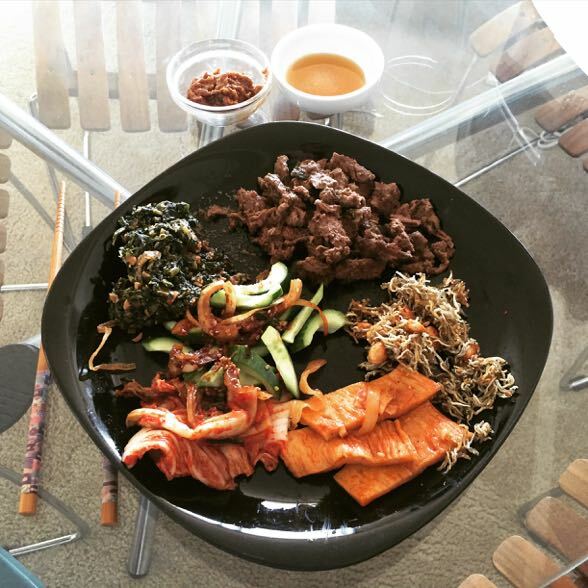 Love Korean food but have also been too intimidated to attempt actually making it myself.